question 08: what makes a good translation? A “good” architectural translation is one that can identify performative characteristics of a built object, and convey it in a new built object, birth it in a new context, deliver it to a new eye. And as a result, something entirely else emerges: a mental bridge. One means something to the other, so too does the other mean something to you. You walk into the Pantheon and realize there’s only one way up. The commotion of Piazza della Rotonda, the elbowing as you crossed the threshold, the Australian next to you frantically taking photographs– as your head slowly tilts upward, that all disappears. And then there isn’t anyone but you. You and your secret peep hole into the blue sky. And maybe the clouds always moved that quickly and maybe the birds always flew that closely together. But today, you notice. 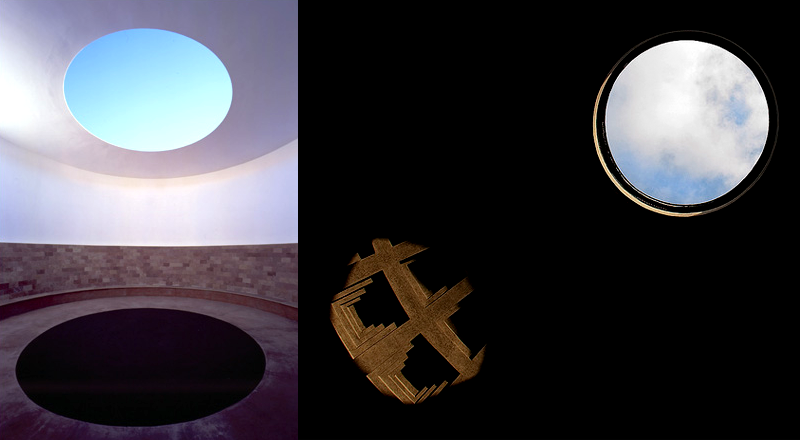 In 1979, a man called James Turrell purchased Roden Crater, northeast of Flagstaff, Arizona. Although hardly a concrete temple honoring ancient Roman gods, Turrell is turning this extinct volcano into the home of a much anticipated study in light, sky, and astronomy, in the form of skyspaces. These skyspaces open you up to the above, glorifying light itself. I’ve never been to Flagstaff; I cannot speak from personal experience, maybe that’s my mistake. Neither can I speak with confidence that any inch of Turrell’s mind was occupied by the Pantheon when he conceived of this; maybe that’s another mistake. But I would argue that the two, though physically and contextually very different, could fundamentally be the same.